All of a sudden the NHL has reverted back to the wild, brawl-filled days of the 1970s. Earlier in the week the Bruins and Canadiens exchanged pleasantries which ended in the Habs questioning whether they need an enforcer after the Big Bad Bruins savagely beat a few Canadiens during the final minutes of the game. The final score was also 8-6 Bruins – another indication that it was the 70s. The league did not hand down supplementary discipline, which prompted some pundits to question whether the league’s silent acceptance of the violence led to the melee that occurred in Long Island on Friday night. The Islanders exploded and scored nine goals against the Penguins, which was overshadowed by a fight filled night that bears an eerie resemblance to the night Todd Bertuzzi sucker punched Steve Moore, leaving him severely injured. There were almost 350 minutes in penalties, a despicable sucker punch, a goalie-on-goon fight, and a player leaving the bench to jump into a fight. I know this blog is titled Five Minutes For Fighting, which seemingly encourages ‘old-time hockey’ in all its forms, but as Puck Daddy succinctly put it, “there’s old time hockey, and then there’s a prison riot”. Well said. Friday night was not a good ol’ game where the refs let the boys settle their scores like men, it was a disgusting display of cowardice and goonery that has no place in the game of hockey. All this game lacked was a serious injury to prompt the View to explain to the world that this is the norm in the NHL. 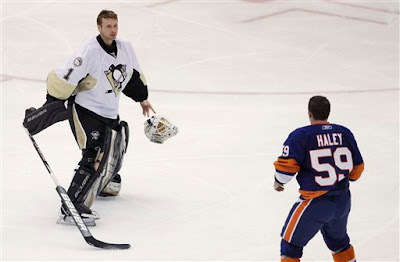 The Islanders had only a week to fume over a 3-0 defeat at the hands of the Penguins where not only did Rick DiPietro get knocked out by Brent Johnson, but Blake Comeau suffered a concussion from a blindside hit from Max Talbot. So the Islanders were out for some revenge. When you’ve been in last place since the 1980s you’ve got to play for something. The game’s first fight was between Eric Godard and Trevor Gillies, which is fine, two heavyweights going at it, staying within their weight-class trying to fire up their respective teams. Fine, whatever, get on with the game. What was really disturbing happened after the Islanders were leading 6-0. Matt Martin, a winger who has yet to display any discernable talent, skates up the ice and notices he’s skating besides Max Talbot – public enemy number one. So he decides that soundly defeating the Penguins on the scoreboard isn’t enough and he subsequently sucker punches Talbot. This is the moral equivalent of Bertuzzi on Moore, except Martin had the sense to throw a blindside sucker punch rather than hitting a totally unsuspecting opponent. What a hero. Obviously there was a brawl afterwards. When I said cowardice before I was talking about Martin – not Talbot, who some meat heads will insist turtled. A sucker punch is always a cowardly move. If you want to fight Talbot be a man about it and ask him to go. Obviously, Talbot had some idea that the Islanders were going to go after him and considering he has 18 career fights in the NHL it isn’t unreasonable to think he would have dropped them with an Islander early in the game to atone for his hit. The league suspended Martin for four games, which is consistent with the four game suspension they gave Ben Eager earlier in the year for his sucker punch on Toronto’s Colby Armstrong. But I don’t think four games are enough considering the context. Eager was a meathead who snapped in the heat of the game and punched Armstrong. Obviously deserving of a hefty suspension, but Martin was a player looking for revenge and looking to seriously harm Talbot. If the league was serious about stopping this kind of non-sense, they should have slapped Martin with 10 games. This night could have easily turned into another Bertuzzi-Moore. Dan Bylsma is somewhat culpable in this situation as well. He should have known the Islanders were out for revenge; therefore, put Talbot out on the opening shift to get it over with. Talbot fights right away, gets it done quickly and we get on with the game. This is what Bylsma did the first game between the Pens and Bruins after Matt Cooke’s gutless hit on Marc Savard. This diffused all the tension in the building right away and didn’t let the night descend into a violent mess. That didn’t happen on Friday considering there was another brawl later in the game. The next brawl started in the third period when Trevor Gillies – another disposable goon without any talent whatsoever – threw a flying elbow at Eric Tangradi and immediately started throwing punches at the visibly shaken Tangradi. In the scrum, Michael Haley, recently called up to the Islanders, finds Talbot and begins to fight him. You know, because he must have such an outstanding history with him. It bears mentioning that Haley has accumulated 144 penalty minutes in 50 games in the AHL this season and was called up by the Islanders specifically for this reason. They let a wild dog of the chain. Next, Haley skates the length of the ice to fight goaltender Brent Johnson. So, Haley’s trying to exact vengeance on the culprits of last week’s attacks (umm, ignoring the fact that Rick DiPietro was more than willing to fight Brent Johnson – so much so that he had a wide smile on his face before taking a swift left hook). That fight is interrupted by Eric Godard who hops the bench to become the third man in – receiving an automatic 10 game suspension in the process. It was honestly disgusting. As if all of this wasn’t bad enough, Trevor Gillies is seen saying something to Tangradi as the trainer attends to him on the ground. I’m going to assume that it wasn’t anything pleasant. Tangradi now has concussion like symptoms and will miss at least today’s game against the Rangers. Gillies has received a nine game suspension from the league for his WWE style antics, which is appropriate considering he clearly tried to maim Tangradi. The Islanders as a team were also fined $100,000 by Colin Campbell, which might actually do something considering the Islanders are a financial mess. Of course the Islanders were out for revenge on this night, but this also seems like the product of being continually beaten down not only on the scoresheet, but in the papers and on the internet. The Islanders have been the league’s laughingstock for decades (save for a few seasons of mediocrity). They are continually called bottom-feeders, losers, no-talent hacks, etc. They even received a disproportionate amount of negative coverage last week after DiPietro got one punched. By the way, for some reason people absolutely love seeing DiPietro get injured. It makes us feel better about ourselves somehow. Hearing such malicious comments all week was a bit much, even by Islanders standards. It’s amazing the Islanders haven’t exploded in this way earlier considering the way everyone treats them. The teams conclude their season series in Long Island on April 8th. I think everyone got what they deserved. The 4 games for Martin is a little light, but you know it would've been a whole different story if Talbot got injured from that punch. The Islanders have been the laughing-stock of the league for some time now, and like you said, no big surprise that they snapped. But when you're calling up goons from the minors for a specific game, then it's a pre-meditated snap, and they deserved that $100,000 fine too. In the end, this is still hockey and games like this will happen, so I don't think it's anything new.